A 10-year-old boy won a science fair in Lexington, Kentucky, after “proving” that Tom Brady and the New England Patriots are cheaters. The boy, Ace Davis, wanted to prove whether Brady was a cheater by using science, using examples of how a deflated football gave the future Hall of Fame quarterback an advantage. During experiments he conducted with his mother and sister, Ace discovered that the least inflated football went the farthest, which could give Brady an advantage when passing. He also included meme-like photos of Brady, 41, crying or making unusual faces. During the AFC Championship game in 2015 in which the Patriots defeated the Indianapolis Colts, Brady was suspended for the first four games of the 2016 NFL season. “The Patriots were found guilty of doctoring football [sic], thus losing $1,000,000 and future draft picks. Tom Brady is indeed a cheater,” Davis concluded in the project. The reason why he made the project is simple, he said. He added: “It’s funny and people are tired of watching him in the Super Bowl. And Julian Edelman takes steroids.” He didn’t provide a reason why he thinks Edelman takes steroids. Instead, Ace said he likes Tampa Bay Buccaneers quarterback Jameis Winston. The boy also made a prediction for the Patriots against the Los Angeles Rams in Super Bowl LIII in Atlanta on Feb. 3. “Julian Edelman pushes everyone around, Gronkowski gets shut down, Gurley runs for 2 touchdowns, Brady plays terrible–three interceptions, Rams win 30-14,” he told Draft Diamonds. 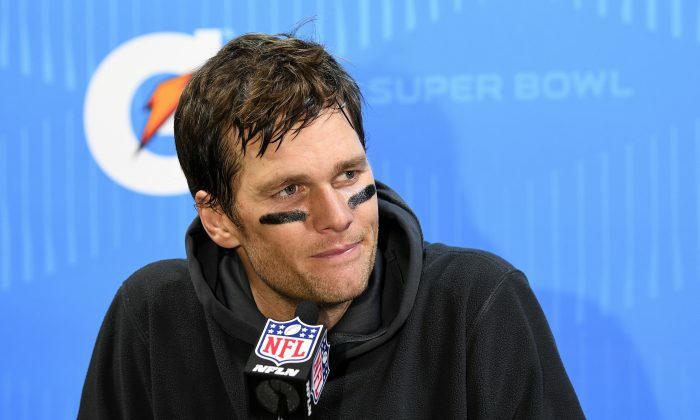 In addition, Ace doesn’t think Brady is the greatest of all time, as some have proclaimed, saying that former San Francisco 49ers quarterback Joe Montana is. Ace said he’ll take his project to the Kentucky level now. “I’m gonna win that too,” Ace added. Meanwhile, the NFL is investigating a report where a laser pointer was allegedly flashed at New England Patriots quarterback Tom Brady, during the AFC Championship game against the Chiefs in Kansas City. 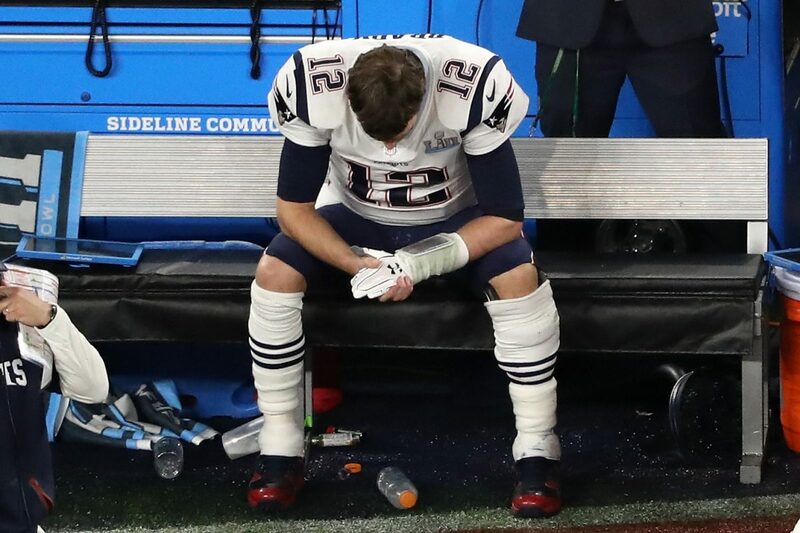 Tom Brady #12 of the New England Patriots sits on the bench after having the ball stripped by Brandon Graham #55 of the Philadelphia Eagles late in the fourth quarter in Super Bowl LII at U.S. Bank Stadium in Minneapolis, Minn., on Feb. 4, 2018. A green laser dot was focused on Brady’s face and upper body during the fourth quarter on Sunday evening in Arrowhead Stadium, the Boston Herald reported. NFL spokesman Brian McCarthy told Sports Illustrated that the league is looking into the laser report, but he said it didn’t affect the game. A laser can damage a person’s eyes. The laser beam was spotted on Brady at least three times in all. KMBC, a local Kansas City station, quoted laser researcher Charles Cobb as saying that based on the size of the dot, the person was sitting far back in the end zone or in a corner.